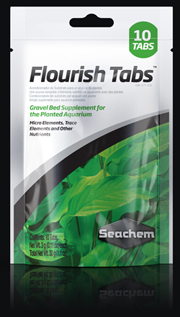 Flourish Tabs™ are growth stimulating tablets for plant roots. They contain essential trace elements, amino acids, and vitamins. They are rich in iron, manganese, magnesium, calcium, potassium, inositol, choline B12, biotin, and other factors that have been determined to be beneficial to aquatic plant roots. View a chart of Flourish Tabs™ constituents and signs of their deficiency. They contain no phosphate or nitrate that would promote algae proliferation. Each pack of ten tablets treats a 12 X 30 inch plant bed twice. Perfect for the beginner, Flourish Tabs™ contain all the nutrients found in Flourish™ in a dry, tabular form. These tabs are inserted into the gravel, providing direct, time-released fertilization to the plants' root zone. Nutrients are slowly made available through enzymatic action of the plants' roots on the tabs.